The Turkish Chief Rabbi, Isak Haleva, has complained to the government after it stalled for months on authorising elections for a new holder of the office. 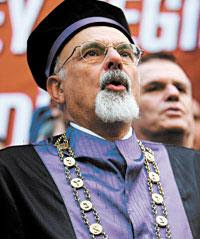 Rabbi Haleva's seven-year term of office expired last autumn, but elections could not be held because of a row between the Turkish authorities and the community over the official title of the post. The authorities refused, for reasons that were never explained, to allow the next holder of the post to be called "Chief rabbi of Turkey", and insisted instead on simply "Chief rabbi". A compromise was eventually reached in which the post-holder would be called "Chief rabbi of Turkish Jews", and a letter was sent allowing the Jewish community to go ahead with the election. A vote should take place shortly, with Rabbi Haleva widely expected to win a second term. Liberal Turkish paper Milliyet reported that the row was part of a wider governmental strategy to stop non-Muslim communities appointing leaders and force all minority faiths to appoint one joint representative. Rabbi Haleva made the complaint to the government during a meeting with the Turkish Minister for EU Affairs and Chief Negotiator Egemen Bagis about the problems of non-Muslim communities in the country. The meeting was also attended by Greek, Armenian and other religious leaders. Other issues he raised include the legal ban on Jewish and other minority schools admitting students of foreign nationality. The Jewish High School in Istanbul, like the Greek and Armenian schools, cannot admit students who hold foreign citizenship, including Israelis. He also asked the government to consider including provisions in the penal code to justify legal action against antisemitic material in the press, a particular problem in some pro-Islamist publications. The official view over complaints about antisemitic articles in the past has been that there is no legal basis for legal action. Jews in Turkey are an officially recognized minority under the Lausanne Treaty, and the United States Department of State's International Religious Freedom Report estimates their number at 23,000. Anti-Semitism in Turkey has been rising since Israel's invasion of Lebanon in the summer of 2006, and took a dramatic turn for the worse following Israel's invasion of Gaza in December 2008. Anti-Semitic comments, as the JC.com article notes, are common in Islamist newspapers and the political rhetoric of religiously conservative parties.